Lasagna (singular, plural lasagne, but always spelled lasagne in Italy and UK) is both a form of pasta in sheets (sometimes rippled, though seldom so in Northern Italy) and also a dish, sometimes named lasagne al forno (meaning "oven-cooked lasagne") made with alternate layers of pasta, cheese, and often ragù (a meat sauce) or tomato sauce. 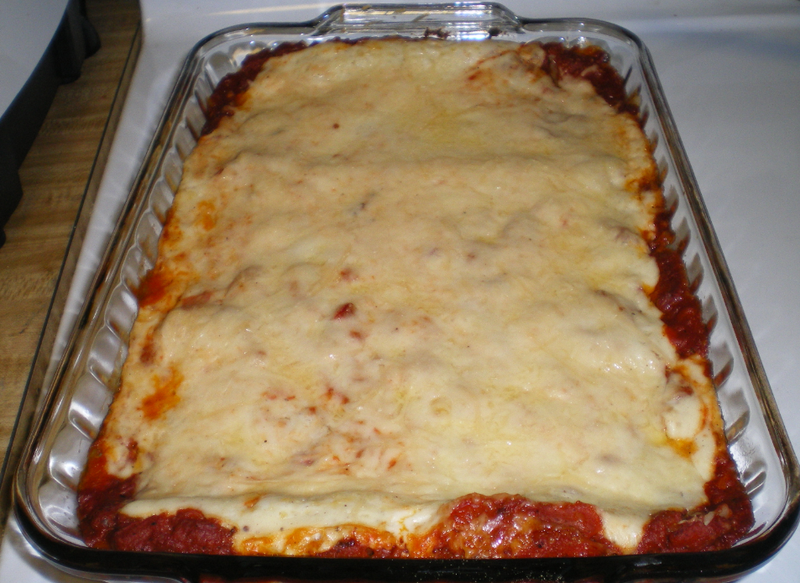 The word lasagna, which originally applied to a cooking pot, now simply describes the food itself. Some recipes call for more than one cheese, most often ricotta and mozzarella. Mozzarella is made in the south of Italy, so the use of these two cheeses is typical of lasagne made in Naples or further south. "Lasagne verdi" (green lasagne); made with spinach and cheese. Lasagne alla Bolognese uses only Parmigiano Reggiano, Bolognese sauce and nutmeg flavored béchamel sauce (besciamella). Classic Bologna lasagne should be made with Lasagne verdi (green lasagne) which is egg pasta with added spinach, although in other towns of Emilia-Romagna, the lasagne need not be green. As with the term 'lasagne', the verdi variety can refer to the dish or the pasta. 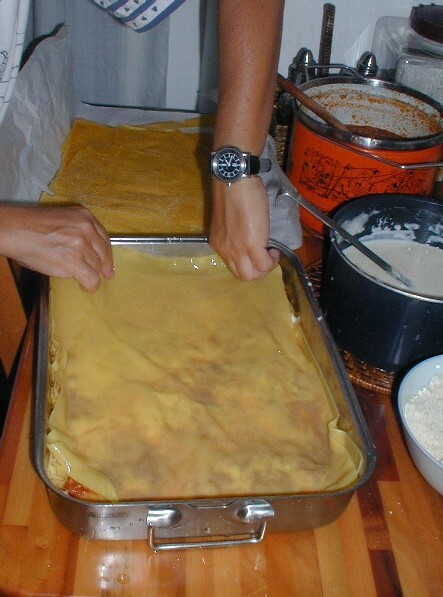 A vegetarian version of the traditional Bologna lasagne or “Lasagne alla bolognese" is sometimes found in adjacent in Tuscany – not traditionally a pasta region – and other regions. It substitutes a simple tomato and basil sauce for the Bolognese sauce, arranged with layers of noodles, nutmeg flavored béchamel sauce and Parmigiano-Reggiano cheese. Especially outside Italy, there are many variants, from artichoke spinach lasagna to spicy chipotle lasagna to vegetarian, seafood and tarragon versions. The dish lends itself to creative use of ingredients by home cooks as well as chefs. You can also make lasagne with pasta.